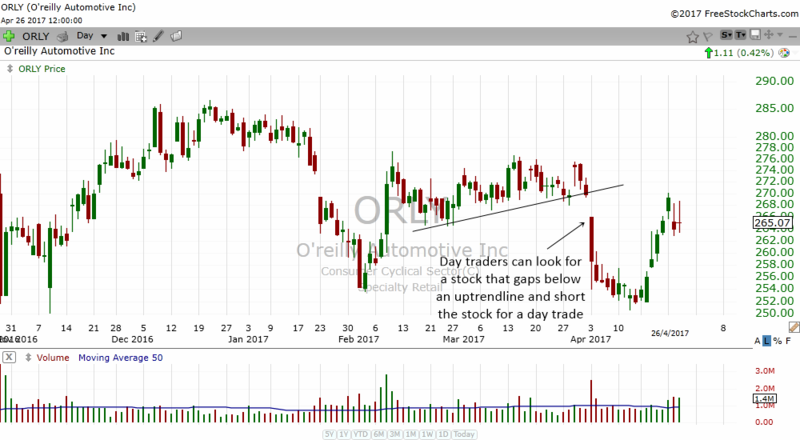 Daily stock charts are the best places to find trading opportunities for position traders, swing traders and even day traders. I would say that 95% of traders use the daily charts to scan for opportunities before zeroing in to their preferred time frame to find opportunities. The daily charts are the ones that are often shown in financial newspapers and even on news channels. If you haven't been using stock charts to find trading opportunities, then you are missing out on some of the biggest way to make money in the stock market. Allow me to show you how you can find some great trading opportunities by using the daily charts. Trading breakouts are one of the most popular ways to make money in the stock market. Whenever a stock that is in an uptrend trades sideways for a period of time, traders will put it on their watchlist and set an alarm waiting for the stock to breakout. Once the stock trades above the highs of the consolidation, traders will jump in and buy the stock. 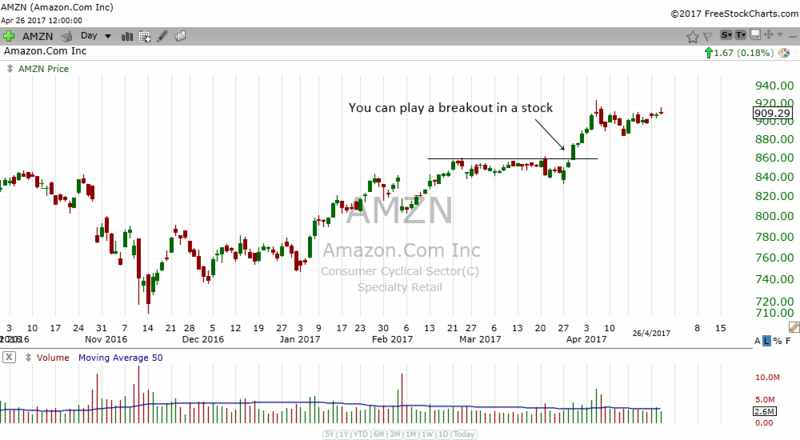 Take a look at the stock chart of Amazon above. Notice how the stock move sideways for a period of time and then as it broke out of the trading range, traders will jump in and buy the stock. Moving average crossovers are some of the most basic and simple trend following strategies employed by traders. Traders will use a shorter MA and a longer MA. When the shorter MA crosses above or below the longer MA, it will give traders a buy or sell signal. 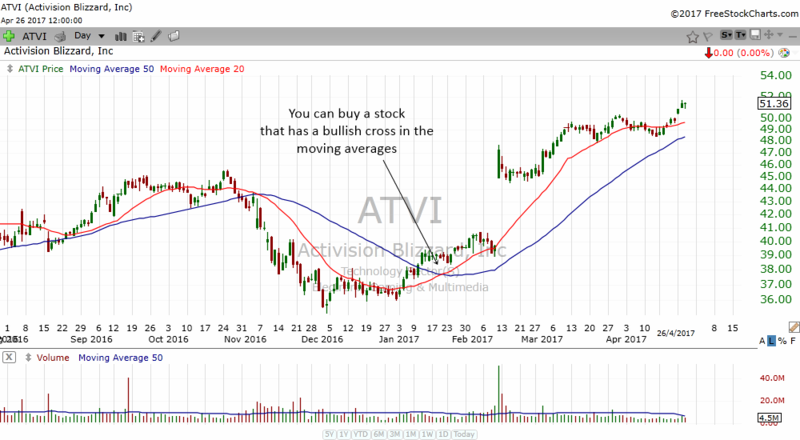 In the chart above, you can see how ATVI produced a buy signal in January when its 20 MA crosses above its 50 MA. Look how much the stock rose. A stock that is above its rising 20 MA is a stock that is in an uptrend. An uptrending stock is a strong stock and has high odds of going higher. Whenever the stock touches its rising 20 MA, you can think of purchasing the stock and ride the trend higher. 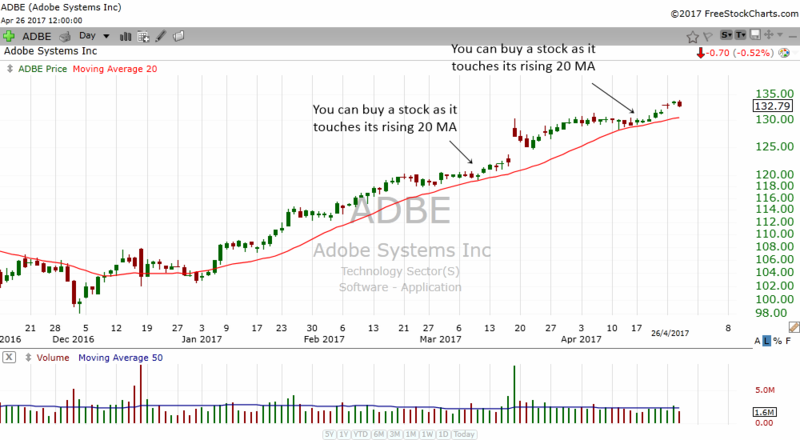 The stock chart of ADBE above is a great example of how a trader can jump into a stock that is trending up. Japanese Candlestick Patterns are one of the best and most reliable reversal or continuation patterns. Legend has it that a Japanese rice trader was able to make huge amounts of money employing these patterns. Today, Japanese Candlestick Charts are the most popular type of charts that traders all over the world use. One of the most popular candlestick patterns is the bottoming tail pattern or hammer pattern. 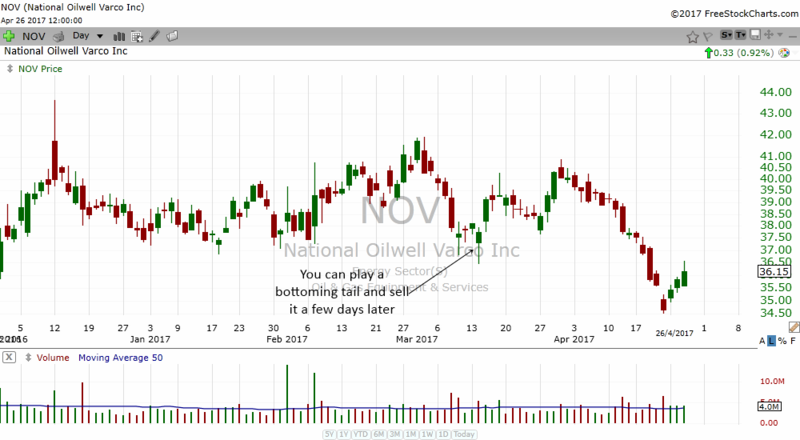 This is a bullish reversal candlestick pattern and traders can buy a stock that has formed this pattern for a swing trade. In the chart above, NOV formed a bottoming tail and traders could have bought the stock and hold it for a few days before selling it for a profit. The bullish engulfing pattern is also a very popular bullish reversal pattern. Traders can buy when the stock price trade above the pattern and hold the stock for a few days. 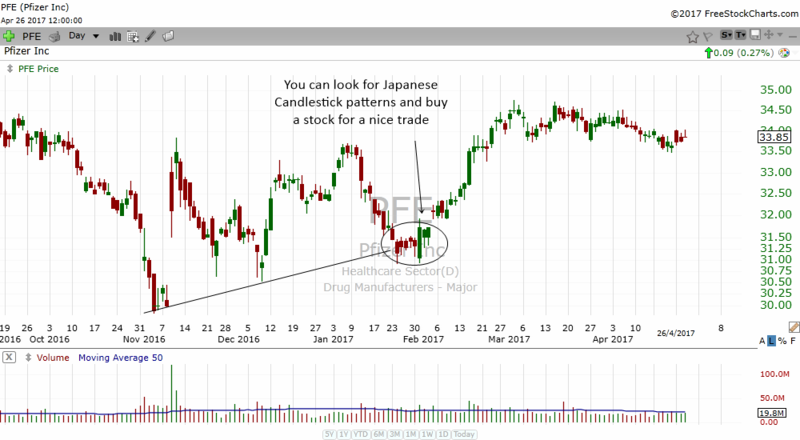 In the chart above, PFE formed a bullish engulfing pattern right at the uptrendline support. Look how the stock shot higher after the stock traded above the highs of the pattern. There are many many more patterns and as you learn more about trading, you will realize that patterns can appear anywhere and in all time frames. 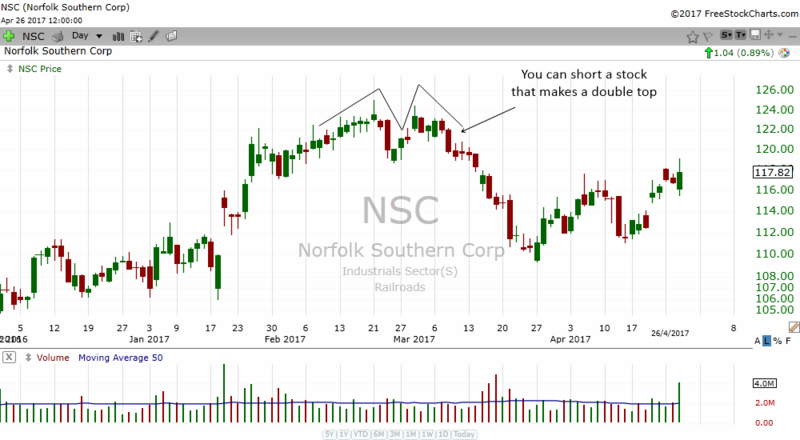 In the chart above, you can see how NSC formed a double top in its daily charts. Observent traders could have shorted the stock and made some profits out of it. 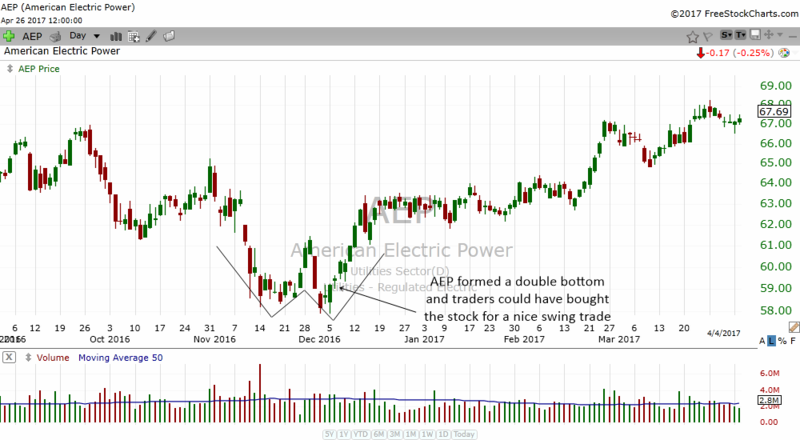 AEP formed a double bottom which is the reverse of a double top. Observant traders could have bought the double bottom for a swing trade, holding it for a week or two and then selling it for a nice profit. There's always something magical about trendlines. Stocks often rise or fall when they break a trendline. There are many traders whose trading techniques include playing stocks that break above or below their trendlines. 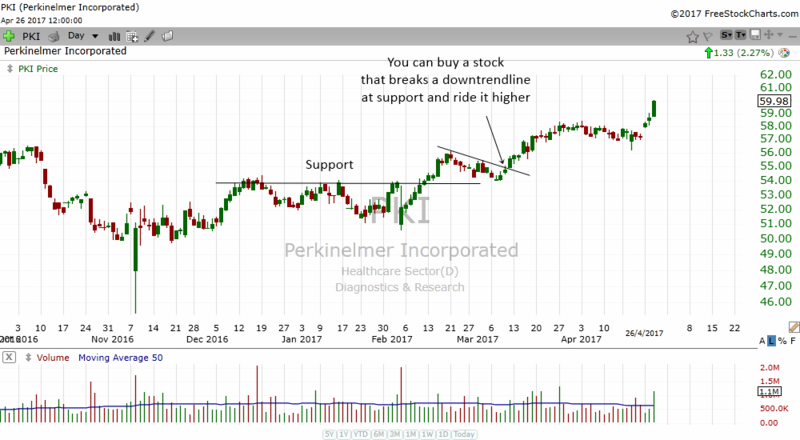 The chart above shows how a trader could have bought a stock as it broke above a short term downtrendline. The trading strategy above is what I call a break downtrendline at support trade. There are no indicators involved but the mere fact that the stock breaks a short term downtrendline at support is enough to tell the experienced trader that something big was about to happen to the stock. Those who bought it for a nice swing trade would have made some good profits. Gaps are one of the most popular setups that day traders love to play. When a stock gaps up or gaps down it is telling traders that a big shift in sentiment and outlook is happening to the stock. A stock that gaps up can move up 10%, 20% and even 50% in a single day. This is an excellent area for the day trader who like to buy a stock and hold it for 10-15 mins. On the other hand, when a stock gaps down, the stock can often fall 10%, 20% and even 50% in a single trading day. Traders who like to short sell stocks will come in and short the stock for a quick day trade. In the chart above, we can see that ORLY had a big gap down below its uptrendline. Day traders who like to short stocks would have entered the stock, shorted it for a day trade and covered it by the end of the trading session for a nice profit. As you can see from the charts above, the daily stock charts can really be a gold mine for traders to seek trading opportunities. Position traders can find stocks that bounce of their 50 MA and 200 MA to hold for a few months. Swing traders can look for bottoming tail patterns and hold the stock for a week before selling it. Day traders can find gaps in the daily stock charts and long or short the stock for an hour or two. Once you go through our Stock Market Course, you will be able to spot many many trading opportunities that have eluded you in the past.